it’s your 24th birthday, and you’re not here, and you’re very much here. I didn’t know exactly how I wanted to spend the day, but I knew I wanted to do some ritual to honor you, and also something to nurture myself, some way of tending to my body – my “flesh and blood holder of humanity” as you wrote so eloquently. Then a couple of days ago I saw someone announce on Facebook that she had an opening for an ayurvedic massage today, and that seemed perfect – it showed up and presented itself, so I said yes. Next I realized this was the day to take some of your ashes up to Mount Lemmon. I know you loved it there and it was the other place I knew I needed to leave some of your ashes before leaving Tucson. First thing though, I shared one of my favorite poems of yours on FB, A Lifetime. It feels to me that it says so beautifully what you wanted to do, and what you did in this lifetime. It makes me happy to know you even thought about all of those things, and then that you got to experience it all…it’s quite extraordinary. After my relaxing massage, I was ready to drive up the mountain. 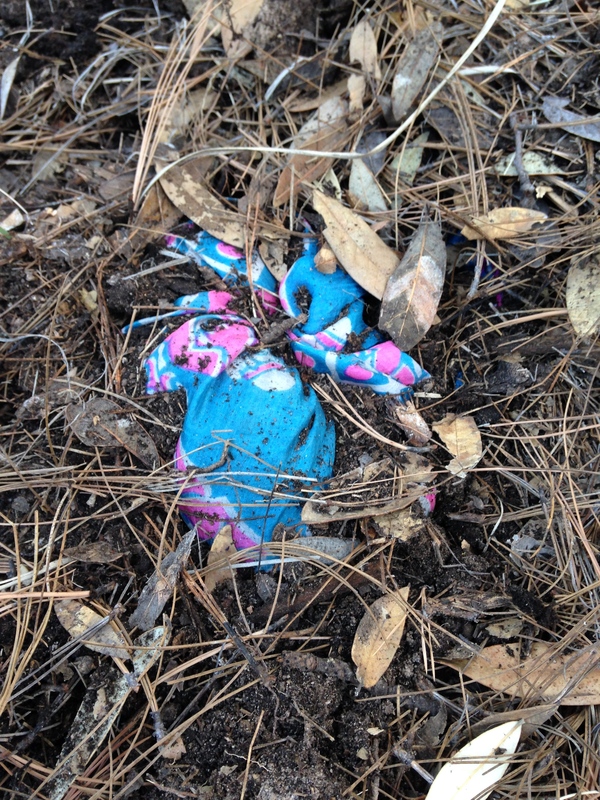 I packed up your bundle of hair, carefully wrapped in one of your scarves, and a shovel. I still had the hair you’d saved from when going through chemo the first time, and I know you’d intended to do some kind of burial ritual, so I wanted to complete that for you as well. 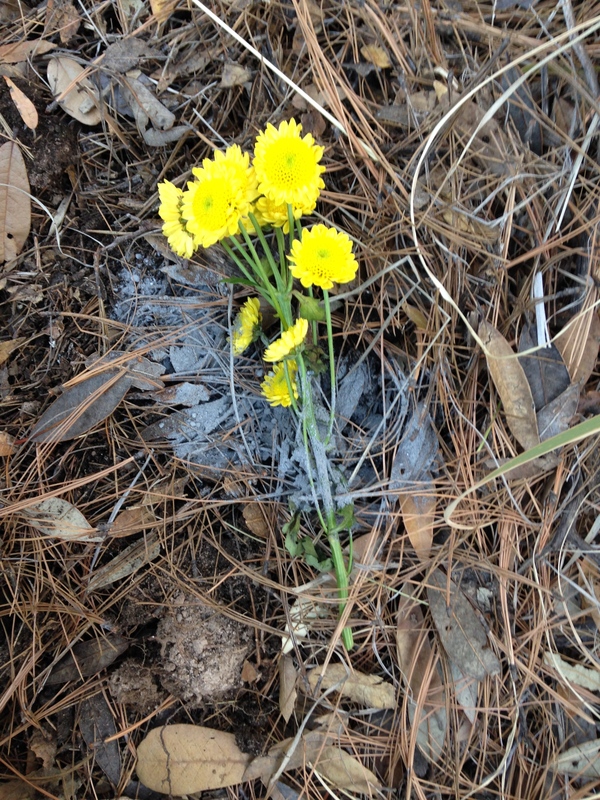 I took some flowers, and then filled a small glass bottle with some of your ashes to offer to Mt Lemmon. I got back in my car and drove further up, looking for a place with the really incredible stacks of rocks. I asked you (and I’d been feeling your presence all day of course), where you wanted me to place the rest of the ashes – did you also love those rocks, or was I just imagining that, since I love them…? I heard you say that you do love them, and, to remember that where the ashes go is about what I want, that it no longer matters to you, you’re not in those ashes. You said that you love that I’m taking the time to do this ritual, but it’s for me, not for who you are now…I could also feel the ways that we were, and are, so merged. That there are times that I can’t tell whether it is I who likes or experiences something, or you. I trusted that I’d just know, and sure enough, I saw those rocks, with a parking area, and with Tilly leading the way on her leash, I realized there’s a beautiful area to walk down and among the rocks. I’d been there before but somehow never saw that, even though there were many others walking down that way! I meandered down a path, down to where there was just the view of Tucson desert I’d been envisioning, and placed your ashes in the corner of some huge rocks. It was out of the wind, though I know not for long. And slightly off the main path, but there will be plenty of people coming through. Along with the immense natural beauty, there was also graffiti and cigarette butts, and it seemed the right place for some of your ashes to rest. You were such a combination of the ethereal and very much of this world. When you were little, making up words and dances (like the “hatdeck” when you were 3, and fufia and kufia – were they unseen friends? ), seeing spirits, writing poetry and loving the Spice Girls and Destiny’s Child. Now you seem to be truly at peace, in the angelic world of the ancestors, and yet, you come down and play Angel from Montgomery today on your birthday, which I haven’t heard in months! “To believe in this living, is just a hard way to go…” yes, sometimes it is. So, my sweet girl, though I miss you deeply, and can still hardly believe you’re gone, I am mostly feeling at peace these days. I hear that you want me to be happy, and mostly I am, though I know it’s fine to be sad too, and that crying actually makes me happy at times. I was afraid that this second year, and now your second birthday after you died, would be harder, as some experience that. I’ve found thankfully, that it’s easier with time. I can feel your presence ever closer – almost merging, and yet further away, as you’re more diffuse, more spread out, though still very available when I need to connect. I know that you know all of this, but I wanted to put it into words, to help me remember this day, and share it with others. You make my life so beautiful, along with your sister, and I’m so grateful! Notice the orbs and the lights (including purple ones) that showed up in these photos. 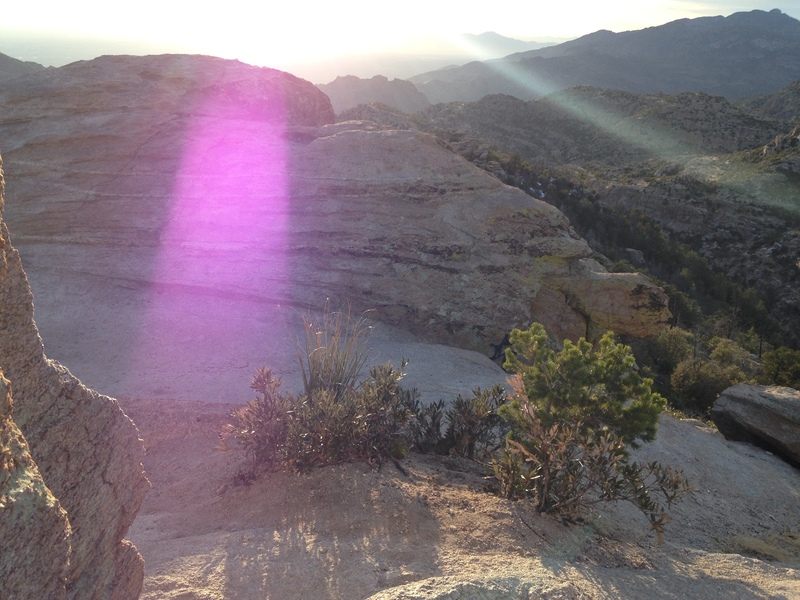 The View from Mt Lemmon, where Elizabeth’s ashes were placed – note the orb and lights! 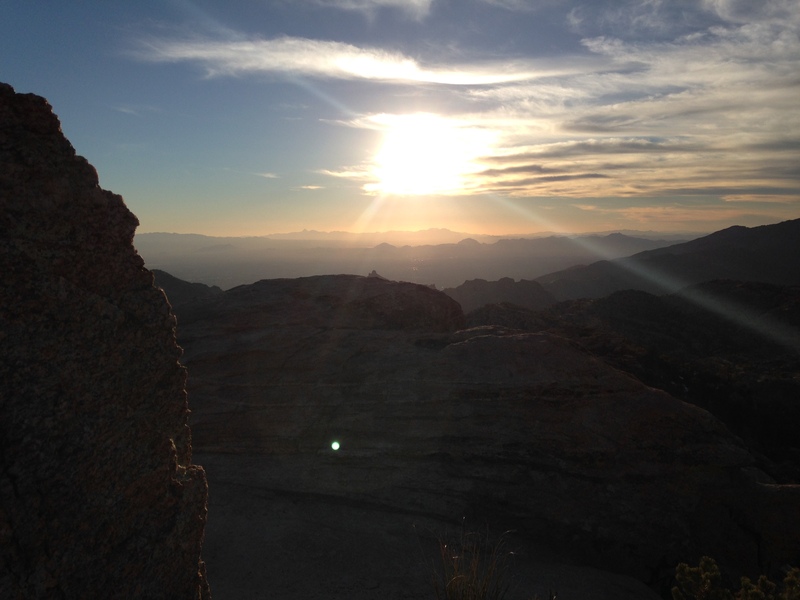 This entry was posted in All Posts, Lucia Maya's Updates and tagged birthday, chemo, death, Elizabeth Blue, Family, grief, healing, Inspiration, motherhood, ritual, saying goodbye, spreading ashes, Tucson by Lucia Maya. Bookmark the permalink. What stunning pictures – and yes, I see the orbs. I’ve never seen them before. You’ve such a sense of her, what to do, where to go. Just from reading this I feel how much she was with you that day. I keep saying Philip came to show me what death isn’t. Elizabeth, too. It’s not an end; and you’re able to take that deep into your heart. May I learn to follow the both of you. Jewish people sit shiva for a week after a family member dies. On the last day we are supposed to go for a short walk — to show the spirit the way out — to set it free. Without even being aware of what I was doing at first, I took my mother’s spirit to all her favourite places in the neighbourhood where I lived. I could feel her smiling and laughing with delight and I was filled with peace and love and joy. It sounds like your day yesterday, and how you and Elizabeth celebrated her birthday was equally special and healing and intimate and beautiful. A perfect sharing of a special day. As my friend once said, when someone dies you don’t lose the relationship, it just changes. I can read by your words how close you still are. It is young Dans birthday on Friday. He would be 14. I still find it all so very sad and tears fall readily. However we were only saying yesterday his birthday last year was so horrible as he was admitted from a restaurant in great pain, and spent a lot of the day crying, at least he’s at peace. The hospital have offered to dedicate a room to him which is a lovely honour and clearly demonstrates how exceptional he was. Sending you lots of love. I am learning so much from your journey, also about how to be a better parent now – more loving, accepting, embracing of all. Thank you so much Lucia.